Find your perfect balance at the Lakeside Spa & Fitness Center, where we invite you to escape everyday distractions and discover a haven for rejuvenation, restoration and indulgence. Let the panoramic views of the Catalina Mountains envelop you and tune in to our spa’s calming spirit and relaxing energy. This magic of the desert touches everything we offer. 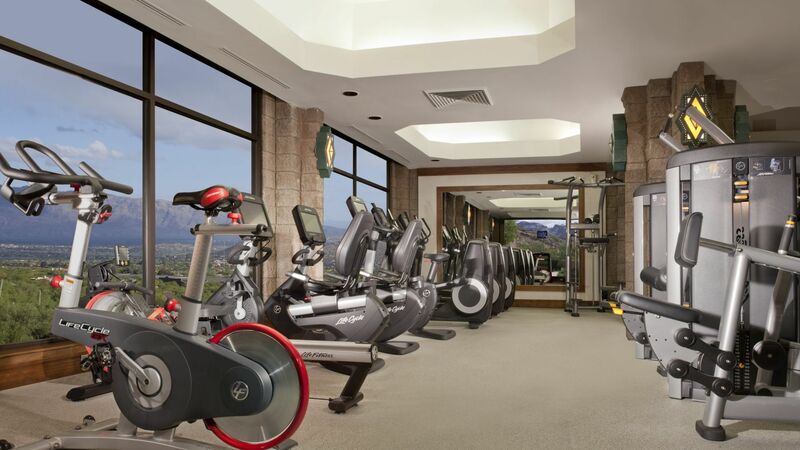 With floor-to-ceiling views of the majestic mountains and a nurturing staff of fitness and wellness experts, our Fitness Center is a hub of motivation and inspiration. Here, guests and members can feel at home whether they’re exploring new routines or enhancing old ones. Energize your morning with a yoga class, cardio tennis, or a swim in our Serenity Pool. Or choose to wind down your day with time on the treadmill; or a relaxing soak in the hot tub. Whether you’re warming up or cooling down, inside or outside, independently or in-class, our Fitness Center makes sure your wellness and health is paramount. Life Fitness strength-training equipment, including resistance machines and a free-weight area. Cardio machines with individual televisions and headphones, including elliptical machines, treadmills, step machines and stationary bikes. A full range of classes including yoga, sculpting and more. Featuring a hand-selected collection of natural and organic fashion, beauty and wellness products, our Lakeside Spa Boutique allows you to bring the best of your Tucson experience home with you. Organic body products used in our signature treatments, desert-stone jewelry, and natural fiber clothing are just a few of the special items you’ll find here. Find your perfect balance at the Lakeside Spa & Fitness Center, as a Lakeside Spa Member you will have full access to a haven for rejuvenation, restoration and indulgence. Membership will allow you to enhance any wellness routine while receiving ongoing savings focused on providing you the benefits you need to relax, explore and flourish. Complement your Lakeside Spa experience with a savory lunch, including appetizers, entrées, salads and desserts prepared by our talented chefs. If your appointment needs are not within the Spa timeframes, please contact us and we’ll make our best effort to accommodate. Hours subject to change. Golf & Spa Special Offer: Enjoy a round of golf for one, daily and a daily spa credit at Lakeside Spa for some R&R. Learn More. At Lakeside Spa & Fitness Center, utilizing the elements that surround us is key to enriching your experiences. For a limited time, enjoy these curated packages - all made with local ingredients. Blue corn, an important crop of the Native American peoples of the Southwest, is blended with desert salt, healing aloe vera and jojoba oil, and used to purify and exfoliate the skin. A moisturizing lotion rich in plant extracts to combat environmental damage and stress is applied, and you are enveloped in a warming wrap. Finished with a relaxing face, neck, and scalp massage to soothe the mind as well as the body. Express Facial will include cleansing, exfoliation and finished with a hydrating moisturizer. Begin with a relaxing foot soak. Nails are cleaned, trimmed and filed. Legs and feet are exfoliated with a Lavender Sugar Scrub followed by a leg massage with our hydrating Lavender Body Butter. Paraffin dip is applied to hands and feet wrapped with hot towels ending with your choice of OPI polish. Our desert oasis is a soothing haven where you can inspire, motivate and spoil groups of friends, family, and even co-workers with an indulgent spa getaway. Here, we offer all you desire to create a memorable morning, afternoon or entire day of pampering and wellness. From Signature Body Treatments and luxurious pedicures to makeovers and hair design, we can customize a group or individual gathering, large or small. Give the gift of relaxation, rejuvenation and indulgence. 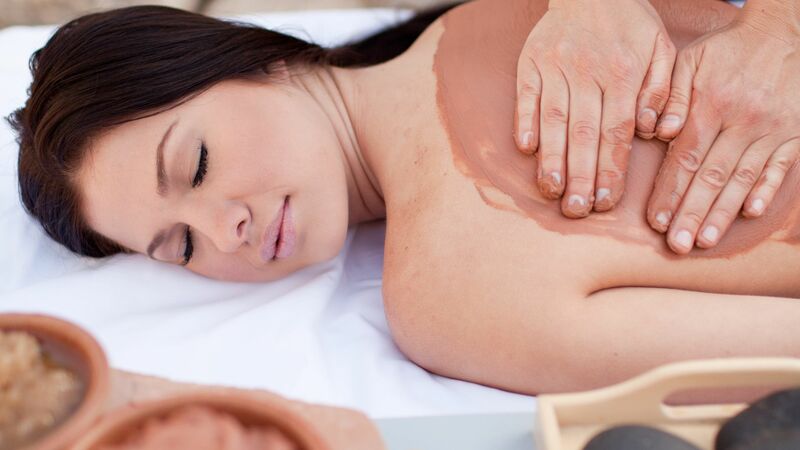 Whether it’s our Hot & Cold Stone Facial, an Aloe Vera and Blue Corn Skin Healer Signature Body Treatment or a Complete Canyon Oasis Package, you’re giving a luxurious gift of health, wellness and natural beauty. Customize an experience or combine spa experiences and create an unforgettable spa day for a friend, colleague or loved one. Let our desert oasis soothe your attendees as our experienced professionals indulge them in treatments and services including massages, facials, body treatments, salon services, fitness programs and more. Special offers are available for groups hosting their meeting at Loews Ventana Canyon. For more information including group pricing and availability, please contact us or your Sales/Conference manager. Let us develop an individual service tailored to the needs of you and your wedding party. Prices are based on time and number of persons participating. Ask your Spa Group Coordinator for details.